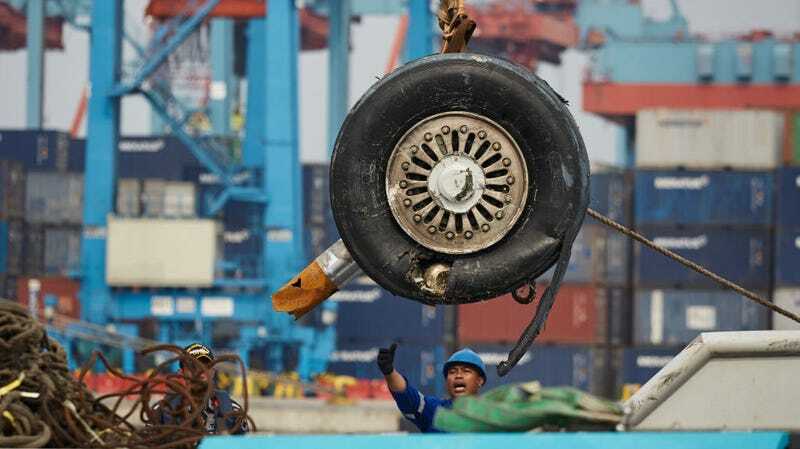 The wrecked landing gear of Lion Air Flight JT 610 is unloaded from a ship at the Tanjung Priok port on November 3, 2018 in Jakarta, Indonesia. Ever since all Boeing 737 MAX aircraft have been grounded worldwide, there’s been a lot of discussion about the anti-stall system that seems to have been the cause of the two recent tragic crashes of the airliner: an Ethiopian Airlines crash last week, and an Indonesian Lion Air crash in late October. In the latter incident, it seems the very same plane narrowly avoided disaster the day before its crash, thanks to the input of an off-duty pilot who bummed a ride in the plane’s cockpit. But the next day, staffed with a different crew that reportedly did not know how to respond to the malfunction, the same plane crashed into the Java Sea and killed all 189 people aboard. The malfunction that seems to be at the root of the recent crashes has to do with an anti-stall system called Maneuvering Characteristics Augmentation System (MCAS), which attempts to point the aircraft’s nose down to avoid losing lift. The problem is that the system appears to be working with faulty sensor data, and is activated when it’s not needed. Cutting power to the motor that controlled the rear stabilizer would have effectively eliminated the faulty MCAS inputs, and allowed the plane to be flown fairly normally. The crew flying the plane the next day did not seem to be aware of either the MCAS issue or the work-around, and the tragic crash was the result. For reasons that are still not clear, the crew of the October 28 flight with the extra pilot did not report the incorrect stall warnings or the MCAS issues after the flight landed. As a result, when the plane flew the next day, the same issues were present. The actions of the deadhead pilot and the issues with the plane were not mentioned in Indonesia’s National Transportation Safety Committee’s November 28 report about the crash. Lion Air has declined to comment about the extra pilot on the flight. Meanwhile, both Boeing and the Federal Aviation Administration—which reportedly delegated some of the 737 MAX’s safety assessments at the company’s own request—face a great deal of questions and hurdles as they attempt to get the jets fixed and flying again.